where Y is the logarithm (base 10) of the survival time; , , are blood-clotting score, prognostic index, and enzyme function, respectively; and is a normal error term. A listing of the SAS data set containing the data is shown in Output 40.8.1. The variables Y, X1, X2, and X3 correspond to Y, , , and , and LogX1 is log( ). The PROC GENMOD fit of the model is shown in Output 40.8.2. The analysis first focuses on the adequacy of the functional form of , blood-clotting score. Note: The scale parameter was estimated by the square root of Pearson's Chi-Square/DOF. See Lin, Wei, and Ying (2002) for details about model assessment that uses cumulative residual plots. The RESAMPLE= keyword specifies that a p-value be computed based on a sample of 10,000 simulated residual paths. A random number seed is specified by the SEED= keyword for reproducibility. If you do not specify the seed, one is derived from the time of day. 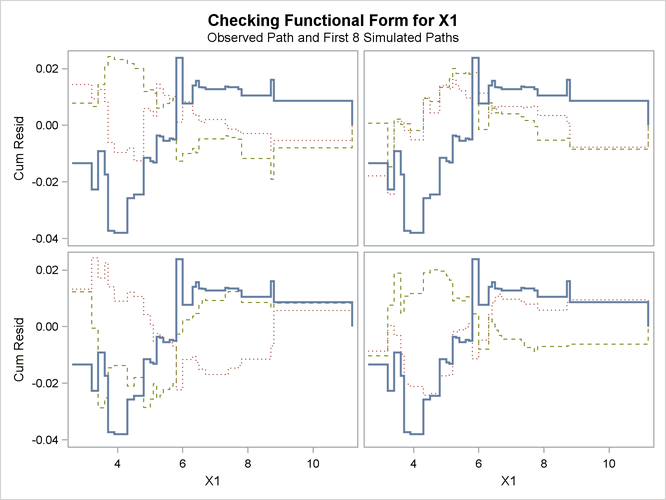 The keyword CRPANEL specifies that the panel of four cumulative residual plots shown in Output 40.8.4 be created, each with two simulated paths. 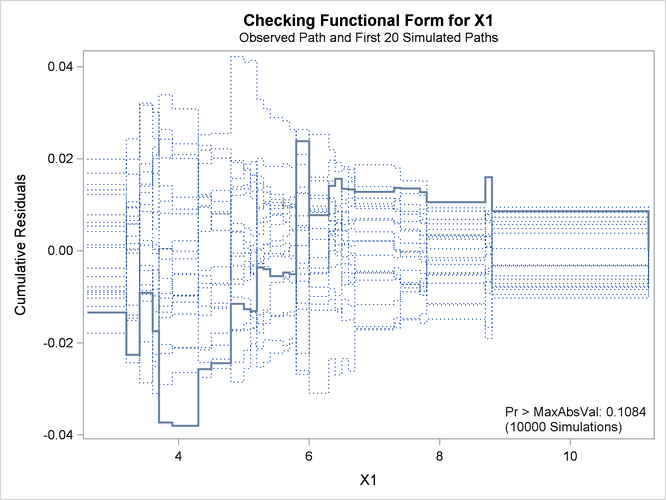 The single residual plot with 20 simulated paths in Output 40.8.3 is created by default. To request these graphs, ODS Graphics must be enabled and you must specify the ASSESS statement. For general information about ODS Graphics, see Chapter 21: Statistical Graphics Using ODS. For specific information about the graphics available in the GENMOD procedure, see the section ODS Graphics. The p-value of 0.1084 reported on Output 40.8.3 and Output 40.8.5 suggests that a more adequate model might be possible. The observed cumulative residuals in Output 40.8.3 and Output 40.8.4, represented by the heavy lines, seem atypical of the simulated curves, represented by the light lines, reinforcing the conclusion that a more appropriate functional form for X1 is possible. 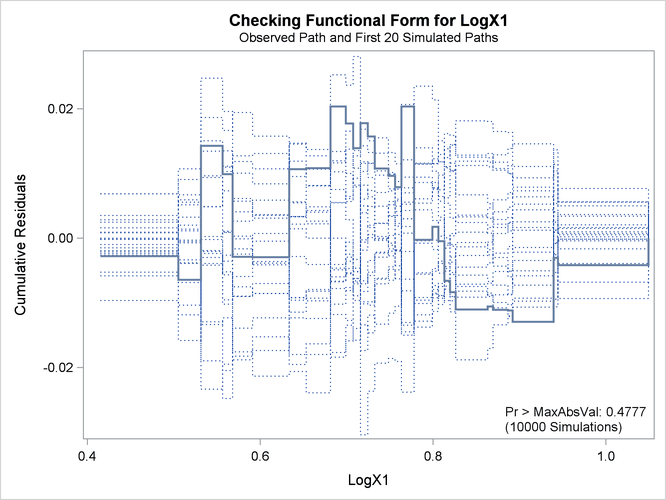 The cumulative residual plots in Output 40.8.6 provide guidance in determining a more appropriate functional form. The four curves were created from simple forms of model misspecification by using simulated data. The mean models of the data and the fitted model are shown in Table 40.19. The observed cumulative residual pattern in Output 40.8.3 and Output 40.8.4 most resembles the behavior of the curve in plot (a) of Output 40.8.6, indicating that log( ) might be a more appropriate term in the model than . The revised model fit is shown in Output 40.8.7, the p-value from the simulation is 0.4777, and the cumulative residuals plotted in Output 40.8.8 show no systematic trend. The log transformation for X1 is more appropriate. 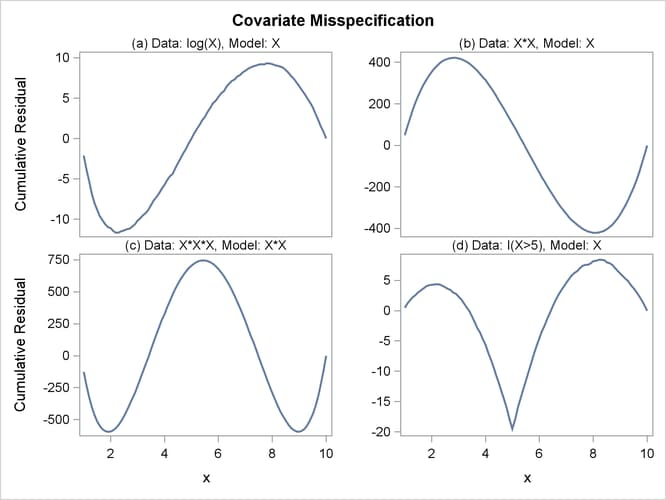 Under the revised model, the p-values for testing the functional forms of X2 and X3 are 0.20 and 0.63, respectively; and the p-value for testing the linearity of the model is 0.65. Thus, the revised model seems reasonable.